S'more season is here! Wait, is there any wrong season for s'mores? I don't think there is. These all American treats are a favorite of young and old alike. Regardless if it is over the campfire, over the stove, or in the microwave, people will do about anything for a good s'more. I came up with this recipe recently. I was helping my sister (number 1) overhaul her kitchen. I know, I know, I am an awesome sister. But that aside, when we were sifting through her COPIOUS amounts of cookie cutters, and got to the bottom (30 minutes later) I found this recipe. Not THIS recipe but A recipe. It was for these cookies. I had never seen anything like it. My sister admittedly had written the recipe on the recipe card, "she has the handwriting of a serial killer" (name that movie) but had never actually made the cookies. That was my signal to get on it. 3 ingredients, I mean, 3 ingredients?!?! They turned out SO soft, I just had to make them into a sandwich cookie. There is nothing you can do that will make these cookies hard. It is my belief that you must have a soft cookie for a sandwich cookie. I mean, who needs TWO cookies crumbling all over their chest and lap? Notice I mentioned chest first? It has nothing to do with experience. Anyway, I did S'more Cookies, but there are a bazillion ways to change it up and out kids. 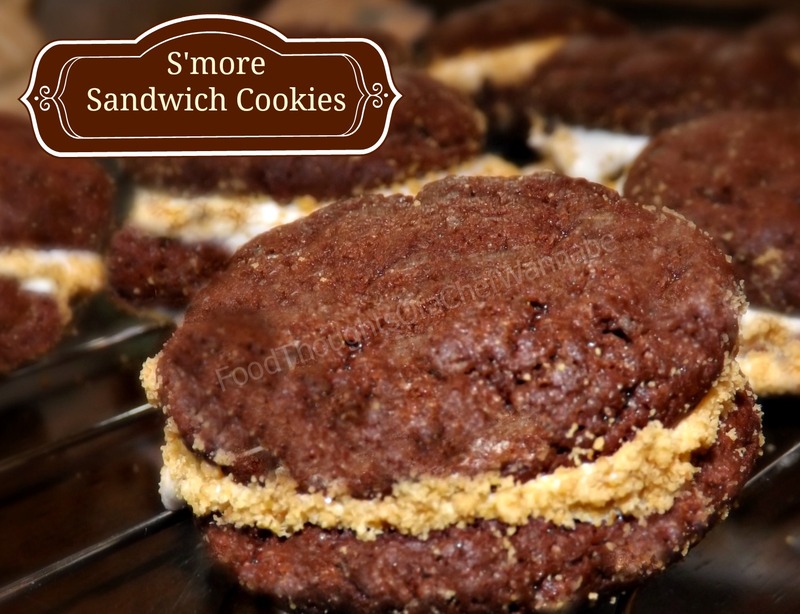 I found ingredients in the cupboard I needed to use up, so S'mores Sandwich Cookies were born, but see what YOU can birth from your cupboards. Wow, that sounds all wrong. But I know, that YOU know what I mean. This cookie recipe makes about 5-6 dozen cookies, and they are awesome just plain. So you will get half the amount in sandwich cookies. Preheat oven to 350 degrees F. Mix all ingredients until completely combined. Roll into 1 inch balls and place until parchment lines or silicone mat lined cookie sheet. DO NOT FLATTEN. They will spread a wee bit when they bake and cool. Place them about 2 inches apart. Bake 8-10 minutes, let cool on the cookie sheet for 5 minutes and then place on cooling racks. Rinse and repeat until all cookies are baked! I threw my crackers in the food processor to make quick work of dust making. Use a Ziploc and something heavy to beat them into cracker crumbs. Place into a dish, add jimmies if you choose and just mix them up and set aside. Take one cookie, add fluff, enough that when you press the second cookie on top it will come out the sides a little bit, because that is what will hold the graham cracker crumbs on. Roll in the crumbs and repeat until they are all done! I would suggest refrigerating until you are ready to serve, or freeze them if you like in an airtight container. If you leave them where it is warm or hot, and they don't get eaten quick, the tops will want to slide a bit as the marshmallow softens. As if it matters, they are awesome!